The introduction of a home solar power system can provide a significant level of free, clean and renewable electricity for members of your household. Not only can these systems provide electricity but they can also help to heat your hot water supply which can result in lower energy bills. If you're interested in reducing your carbon footprint whilst contributing to a cleaner environment then you may already be considering the installation of a renewable energy system to your home. Solar power is often the renewable energy of choice for homeowners across the world due to its general affordability and reliability. Why Should We Install Home Solar Power Systems? There are many reasons why we should install home solar energy systems with the main advantage relating to the significant boost you will receive to your electricity supply which can reduce or even eliminate future energy bills. This provides the potential for your solar energy system to pay for itself over its years of operation. Home solar power systems allow homeowners to reduce their carbon footprint helping to contribute towards a cleaner tomorrow. 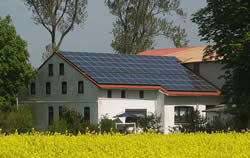 There are a selection of home solar power systems that are suited to varying requirements. These different methods of using solar energy in your home can be combined to provide an even greater reduction in your energy bills and carbon footprint. Solar Power Panels - Provide electricity for your home by converting the sun's rays to electricity through photovoltaic technology. Solar Hot Water Panels - Help to heat the hot water supply of your home which can reduce your energy demand quite significantly. Solar hot water panels are becoming increasingly popular as an alternative to generating power for your home from solar energy. This is an innovative renewable energy technology to use if you are seeking a reduction to your energy bills. Solar power systems can cost varying amounts depending on the capacity that you require. A large scale system capable of powering your entire home can run into the tens of thousands whilst a single solar panel or hot water solar panel could cost you one or two thousand. A large scale home solar power system is often only in the reach of those who can afford the initial cost or for those who can obtain funding from elsewhere. For this reason, some homeowners opt to go for smaller systems that are unable to cater for their full power demands but can still help to reduce energy bills. So there are the two main ways in which solar can power your home, each of which can be adapted to suit your requirements and/or budget. Which solar cell technology is the best? Solar Cells Developed From Trees; Can Be Recycled Too! Solar Energy at Night !! A Village In Assam Uses Solar Power To Run PCs! How is my new blog ? NO Copy Rights Received :). Powered by Blogger.